The Office of the VP for Information Technology and Chief Information Officer provides systemwide leadership for information technology systems and services, and leads Information Technology Services (ITS). ITS is comprised of Academic Technologies, Administrative Services, Client Service and Operations Center (CSOC), Cyberinfrastructure, Enterprise Systems, Information Security, and Technology Infrastructure. Garret T. Yoshimi is the vice president for information technology and chief information officer (VPIT/CIO). He provides executive leadership in collaboratively setting forth the overall vision, goals, strategies and plans for the effective and appropriate use of information technologies to advance the UH System. Yoshimi brings over 35 years of information technology experience in both the public and private sectors. 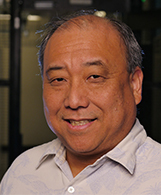 A native of Honolulu, Yoshimi earned a bachelor of science degree in electrical engineering from Purdue University and a graduate certificate in telecommunications and information resource management from the University of Hawai‘i at Mānoa.